Back in Sept, Mattie Mack (I’ve been calling her that lately), had her birthday and turned 4 years old and started preschool all in the same week! She had been so excited to start school and I had been looking forward to that day for a while, but only because she is so social! Anyway, we didn’t throw her a big party this year, one because she will get a party when she turns 5 next year, and two we knew that she would be getting a small party on her first day of school... I did make a cake for her, which we ate for dessert at the Berger’s house after church. The preschool that she is attending is at Palm Bay High School, and is taught by the high schoolers who are interested in becoming teachers. Of course there are adult teachers who help the teenagers and teach them what they should be doing. The program is a Pre-K one, and Mattie missed the cutoff for Pre-K by 9 days. They had not had enough 4 year olds enroll, so they decided to let some 3 year olds enroll as well. My wonderful friend Honor told me about it, and Mattie was lucky enough to get in. Honor’s daughter Delainey is also attending, and she and Mattie are practically joined at the hip! Mattie has really been enjoying her time in preschool, and it has been good for her to experience having playmates everyday. I think at times it was hard for her to be an only child for 3+ years. She is definitely making up for lost time! Anyways, she started school on September 8 and she turned 4 years old on the 9th. I had asked the teacher before the school year started if we could bring in cupcakes for Mo’s birthday, but another boy in the class had the same birthday and he was already going to be bringing in cupcakes on the 9th. She asked us if we could celebrate on the 8th instead, and that actually worked out great for us, since Matt would be heading back to work on the 9th. 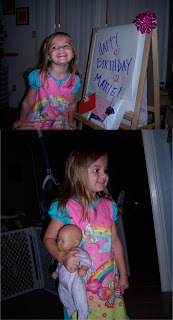 So, Mattie got to have a little birthday party for her first day of school! Matt and I came to school for the last 30 minutes of class and brought Disney Princess cupcakes for the girls and Disney Cars cupcakes for the boys, and Blowpops for the teenagers. Everyone sang to her and I’m pretty sure she enjoyed being the center of attention! We love our Mattie Momo so much and are so grateful that she is part of our family. She is such a sweet and thoughtful little girl. She truly loves her family, especially her baby brother Reddin. I am touched by the love she shows him each day, and the tender way she cares for him. I can’t even begin to express how much I love that girl! 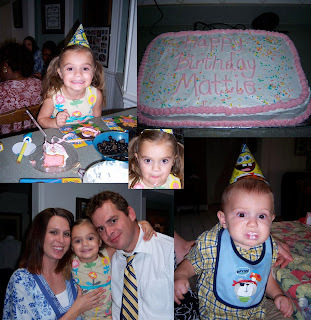 Thanks for choosing us Mattie, we love you! I'm so glad you're catching up on blogging again! 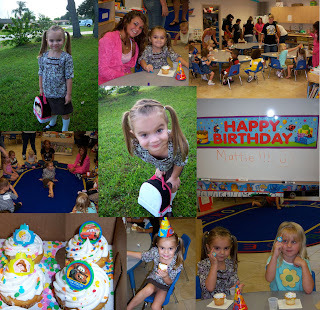 Sounds like Mattie had a great birthday in September, she's such a sweetheart! She is a cutie patootie..and I agree she is very social! That all nighter she and my girls pulled was hilarious! four years old is fun! And her singing was absolutely heart melting in the primary program! Everybody loves Momo!